Today we celebrate as the visitation of Mary. This commemorates when Mary, the mother of our Lord, visited Elizabeth, the mother of John the Baptist, when they were both pregnant (Luke 1:39-45). The Visitation is basically a festival of Christ. John the Baptist and Jesus, the two great figures of salvation history, come together for the first time when Mary visits Elizabeth. Many have noted the step-parallelism in the stories of the two births (and the lives of the two men in general). Both women conceived their children under miraculous circumstances, though the miracle in reference to Mary was greater. Both John and Jesus had their birth announced by angels, but the birth of John was met with disbelief while the birth of Jesus was met with belief. Both children are vital in salvation history, but Jesus had the key role while John announces it. Both die unjustly, but Jesus rose from the dead on the third day while John waits for the Last Day. Back to the Visitation; John is brought into the presence of Jesus while they are still in their mother’s wombs. This presence of the Lord causes a response by the child John as he leaps in Elizabeth’s womb. John’s response to the presence of Jesus, the Messiah, foreshadows John’s own role as forerunner. Already now, a new creation is beginning, and a baby still in the womb hails the new creation’s inception. Foreshadowed in John’s leap are the miracles of Jesus, who will cause all creation to leap at His presence: “The blind receive their sight, the lame walk, the lepers are cleansed, the deaf hear, the dead are raised up, the poor have good news preached to them” (Luke 7:22). The incarnate presence of the Messiah also evokes a response from Elizabeth, who proclaims Mary’s blessedness. Mary’s Magnificat (Luke 1:46-55) provides the theological significance of the meeting as Mary sums up her place in salvation history. Mary’s song is a hymn to God for His gracious gifts to the least in this world, whom He has lifted up out of lowliness solely because of His grace and mercy. This feast is a relative newcomer to the Church Year. It was first observed by the Franciscans in the thirteenth century. Pope Urban IV added it to the Roman calendar in 1389. In 1441 the Council of Basel extended it to the whole Western Church. In spite of its late development, Lutherans have tended to keep it because of its strong biblical roots. Back in the days of The Lutheran Hymnal, it was celebrated on June 2. However, the Roman Catholic Church moved their celebration to May 31, so that the day would make better chronological sense by coming before the birthday of John the Baptist, June 24. Most Lutheran denominations saw the sense of this and also made the change. 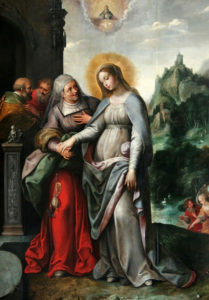 Almighty God, in choosing the Virgin Mary to be the mother of your Son, you made known your gracious regard for the poor, the lowly, and the despised, and you inspired her to visit Elizabeth and assist her in her need; Grant us grace to receive your word in humility, and so to be made one with your Son, Jesus Christ our Lord, who lives and reigns with you and the Holy Spirit, one God, now and forever. Amen.